In 2014, the NFL followed suit, forming an Engineering Subcommittee as part of its existing Head, Neck and Spine Committee. The subcommittee completed its first project in July of 2015, a helmet study jointly sponsored by the NFL and NFL Players Association (NFLPA). Initially, the study set a threshold and broke 10 of the 17 helmets into a “Top Performing Group” meaning none was statistically significant from the others. These two studies have helped players, coaches, parents and fans understand some of the factors involved when evaluating a football helmet. While they’ve come under some scrutiny, they’re still an important part of the buying decision and their results should be taking into consideration, but the studies are far from the only thing to look at. 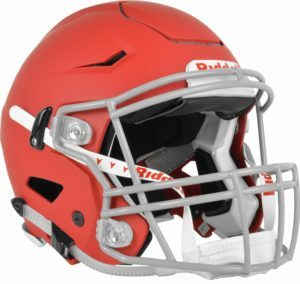 As a sporting goods company that prides itself on our wide selection of football helmets, one of the most common questions we get at Sports Unlimited is, “What is the best football helmet?” The answer isn’t a straightforward one, but we’ve long held that best football helmet for any player is the one that fits him (or her) the best. What’s right for one player may not be right for the next and each player should choose a helmet that offers them the best fit and feels the most comfortable on their head. Both studies have shown in the past that there’s not a direct correlation between price and safety, although that is starting to shift this year. There are similarities and differences between Virginia Tech’s study and the one put out by the NFL and the easiest to spot is that the VICIS Zero1 tops both lists. Built by a startup company formed in 2016, the Zero1 requires the use of a custom fitting kit to assure the helmet fits each player’s head shape. 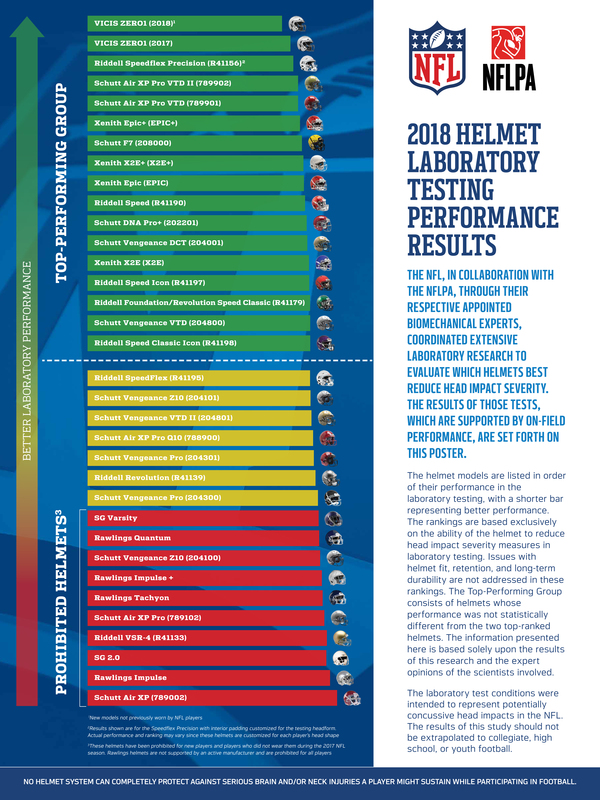 Supporting our “pick the helmet that fits you best” theory, Riddell’s SpeedFlex Precision helmet also scored high marks on both studies, placing third in the NFL’s research in fourth in Virginia Tech’s STAR system in 2018. The helmet also requires a custom fitting, making sure it’s fit for an individual player instead of a standard padding model. For the standard helmets, there’s some variance in the way they’re ranked across both studies. The Riddell SpeedFlex, for example, is the sixth highest VT-ranked helmet. But in the NFL’s testing the SpeedFlex – perhaps the most popular helmet in the league – falls just outside the top performing group. 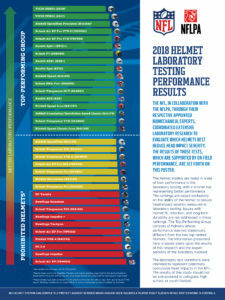 It’s not on the list of prohibited helmets, but it’s behind other Riddell models such as the Speed, Speed Classic Icon and Foundation. 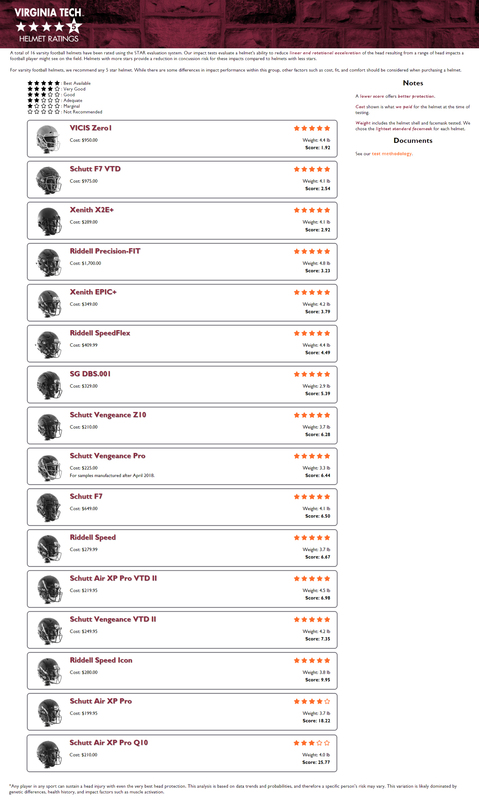 Schutt has similar disparities between the different tests, with the Vengeance Pro and Z10 earning five-star ratings from Virginia Tech’s study, but falling in the same tier as the SpeedFlex in the NFLPA’s rankings. Why these differences exist probably lies in the way the helmets are tested. While Virginia Tech publishes its methodology along with its study, the NFL only says that their “laboratory test conditions were intended to represent potentially concussive head impacts in the NFL.” That likely means more force on impacts and possibly more points of impact. As of 2018, Virginia Tech was testing helmets at four points of impact – front, front boss, side and back – and using three velocities to simulate how often a collegiate player would be exposed to the impacts during the course of a season. The NFL’s most recent study this year goes the extra step to prohibit some helmets from play. Virginia Tech also posts the formula they use to determine their STAR rating and the final ratings on the study. 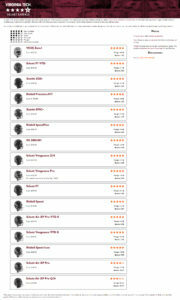 Any helmet that scores under a 10 is awarded five stars, under 20 is four stars, under 30 three stars and so on. So you can see just how the helmets stack up against each other. In the NFL’s test, a bar is used to indicate performance. The shorter the bar, the better the helmet performed in the study, although no numerical values are given. The NFL’s most recent study this year goes the extra step to prohibit some helmets from play. Only players who have used the helmets during the 2017 season will be allowed to wear prohibited helmets, and in 2019 those players will be forced to switch to NFL-approved helmets. Two notable examples of this are future Hall of Fame quarterbacks Tom Brady and Drew Brees, who both have worn Riddell VSR-4 models throughout their careers. All Rawlings and SG models are now prohibited, along with the Schutt AiR XP Pro and AiR XP, along with the first model of the Z10, which has since been upgraded. There is still no helmet that has been created that can prevent a concussion. More and more, helmet studies are becoming an important part of the helmet buying process, but make sure to take them at face value. They are laboratory tests designed to show a helmet’s ability to limit impact on the head. There is still no helmet that has been created that can prevent a concussion. Make sure you select a helmet that fits your head, feels comfortable to you and one that your neck can comfortably support. Continue to use proper tackling techniques and keep your head up while playing the game. As tests and technology continue to evolve, we’ll be here at Sports Unlimited to keep you posted on the latest and greatest innovations to the game.